More on the Rosetta Project | Words, By George! The probe that made Wednesday’s historic comet landing has already started to beam valuable information back to earth, the mission’s scientists say. Scientists have used both ground- and space-based telescopes to study comets for years. In addition, spacecraft have made brief visits to such celestial bodies, including one that flew past Halley’s comet in 1986, and another that crashed a probe into the surface of a comet in 2005. But Europe’s €1.3 billion ($1.62 billion) Rosetta project is expected to surpass all those missions because it is getting up close and personal with a comet for a lengthy period—by orbiting it, by landing a probe on its surface, and in accompanying it as the comet moves closer to the sun. 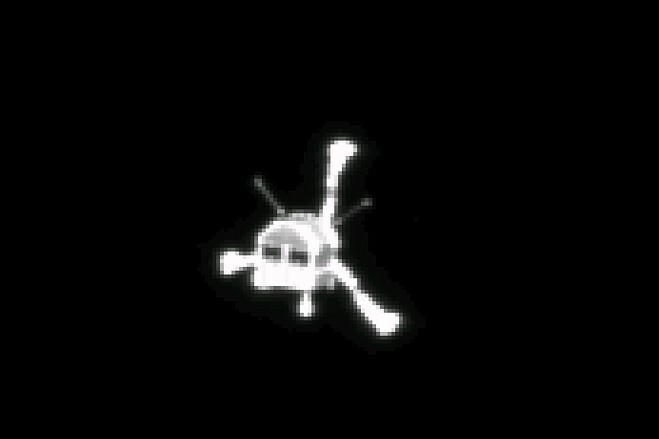 The lander separated from the orbiter at 0903 GMT. In the months before the probe’s landing on the comet on Wednesday, “we’ve collected more data about a comet” than has ever been assembled before, said Matt Taylor, project scientist for Rosetta, a mission masterminded by the European Space Agency. Scientists want to learn about comets because they are essentially deep frozen leftovers that hold clues about how the solar system formed and evolved. They are made of ice, gas and dust—ancient debris that has survived largely intact for some 4.5 billion years. Scientists already know quite a bit about the comet, known as 67P/Churyumov-Gerasimenko. Images taken by Rosetta reveal a comet about 4 miles in diameter, with two segments joined by a “neck,” giving it a duck-like appearance. There are sharp cliffs, crevices and boulders. To many scientists’ surprise, the surface appears to be mainly dust rather than ice, though ice is expected to lie in lower layers. Rosetta’s sensors have also been “sniffing” 67P’s fumes since August, when it began to orbit the comet. The data suggest that comets give off a faint but heady mix of odours, including that of rotten eggs (hydrogen sulphide), horse stable (ammonia), almonds (hydrogen cyanide), alcohol (methanol) and vinegar (sulphur dioxide). Instruments aboard Rosetta show the comet’s growing “coma,” an envelope of gases surrounding its nucleus, is mainly water and carbon dioxide, mixed with carbon monoxide. The coma, which stretches more than 20,000 kilometres, will get even longer as 67P flies closer to the sun and more surface material gets blasted into space. Scientists are especially eager to get their hands on data from the lander Philae. The probe is carrying 10 instruments that are intended to do on-the-spot analysis of the comet’s ices and organic material. A drill would take samples from a depth of 23 centimetres and feed them to an on-board laboratory for instant analysis. That data would be sent to the orbiting Rosetta and then zipped back to earth. The lander is also expected to analyse the water on 67P to see if it is of the same chemical “flavour” as water found on earth. If it is, that would bolster a theory that at least some of earth’s water could have been brought here by comets. The Rosetta mission could also provide information about whether comets could have brought life’s basic building blocks to earth, such as amino acids, which make proteins. A previous mission had discovered the amino acid glycine on a comet. Philae will examine the comet’s surface to see if it, too, can find any trace of amino acids. “The possibility is that comets brought not just water, but—trapped in the water—organic components that are the missing link for explaining the emergence of life on earth,” said Jean-Pierre Bibring, lead lander scientist. If Philae can survive the landing and continue to work for several weeks or even months on solar-powered backup batteries, it could also collect valuable data as 67P flies closer to the sun. Unless it gets shrouded in dust, it may be in a position to collect data as the heat boils off the comet’s icy nucleus and generates the bright halo and ion-and-dust tails that are typical of comets. Even if Philae’s days are numbered, Rosetta will continue to orbit the comet for months to come. During all that time, its instruments will continue to study the comet’s makeup and activity and send that data back to earth. For now, 67P continues to baffle scientists. On Tuesday, scientists said the comet seemed to be emitting a “song” in the form of oscillations in its magnetic field. Though emitted below the range of human hearing, it was made audible by increasing the frequencies by a factor of about 10,000. “We didn’t expect this and we are still working to understand the physics of what is happening,” said Karl-Heinz Glassmeier, a researcher at the Technische Universität Braunschweig, Germany.